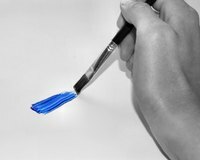 You can mix your own custom light blue paint at home using a regular white paint and some blue tint. This can be very useful if you are matching a paint for which you do not have a chip, or if you want to try several tints to get a precise color. The job is a lot easier if you have a drill with a paint mixing attachment; if not, you will need a lot of elbow grease to really mix the paint fully and ensure that you have a consistent color. Pour the amount of paint you are going to need into a 5-gallon bucket. Use 1 qt. for every 100 square feet of wall. Open the tube of blue tint and begin to add it, very slowly, drop by drop. Stir the paint constantly as you add the tint. It helps to have someone help you. Stop adding the tint periodically and keep mixing until the tint is fully blended so you can see exactly what color you have. Continue adding the color and mixing until you get the light blue you are looking for. It is better to stop just before you think you have the right color and put a test area on the wall so as not to waste paint, then continue. You can't go back once you have added the tint without adding a lot more white paint to make the mixture lighter. Tubes of tint are available at any paint store and most hardware stores. They can be used with any finish of paint -- flat, eggshell or gloss. The paint will dry a slightly darker color than when it is applied. Give the paint 30 minutes after application to dry to make sure you have the color right.